Q: Recently, the president of Spain's Catalan autonomous region said in an address at the Catalan parliament that the region had won the right to be independent as a result of the referendum, but would suspend the independence declaration and seek a dialogue with the Spanish government. What is your comment? 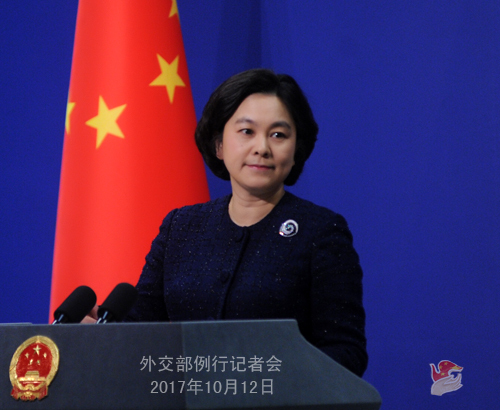 A: The Chinese side closely follows the relevant situation in Catalonia, understands and supports the effort of the Spanish government to uphold national unity, ethnic solidarity and territorial integrity and believes the Spanish side is capable of safeguarding the social order and civil rights and interests in accordance with law. China and Spain are friendly countries. We will continue to develop friendly cooperation with Spain by upholding the principle of respecting each other's sovereignty and territorial integrity and non-interference in each other's internal affairs. 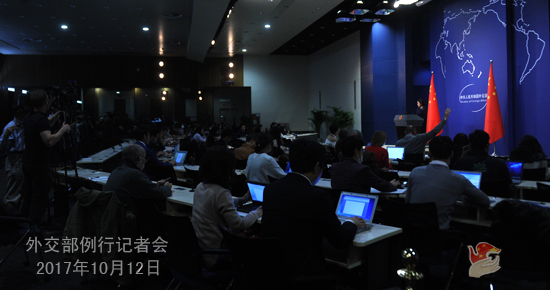 Q: According to reports, the DPRK foreign minister said they will never agree to any talks in which the nuclear weapons will be the subject of negotiations and urges the United States to stop its hostile policies towards the DPRK as the prerequisite for dialogue, and the initiative proposed by China and Russia to address the Korean Peninsula nuclear issue is unacceptable. Do you have any comment on that? A: To realize the denuclearization of the Korean Peninsula and uphold the international nuclear non-proliferation regime is the widespread aspiration of the international community and serves the common interests of the international community. The fundamental reason why the situation on the Korean Peninsula has currently descended into a vicious circle of escalation is the hostility and lack of trust and sense of security between the directly concerned parties, namely DPRK and the US. The only viable way to settle this problem is to address the legitimate security concern of various parties in a balanced way through dialogue and negotiation. Based on the "dual-track approach", the "suspension for suspension" initiative and the step-by-step conception, the joint initiative of China and Russia is a reasonable and legitimate proposal that takes into full account and balancedly accommodates the concerns of various parties. It is conducive to getting rid of the current predicament and finding a breakthrough for the resumption of talk, thus deserving serious consideration and positive response from various parties. At present, the situation of the Korean Peninsula stands at a crossroad. All the relevant parties should bear in mind the fundamental and long-term interests of their own country and nation, stay cool-headed and calm and make wise judgment and choice. Q: The British human rights activist Benedict Rogers was stopped from entering Hong Kong yesterday. 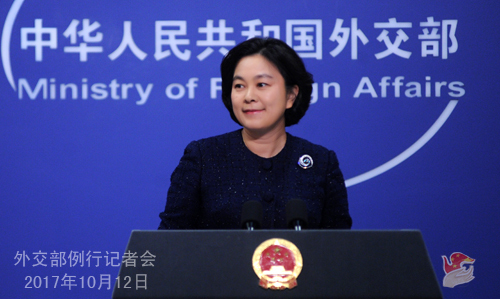 The British government said it has asked China's central government for explanation. Did China's central government tell the Hong Kong government not to let him in? Has the Chinese side already discussed this matter with the British government? A: Hong Kong is a special administrative region of China, and the central government is responsible for Hong Kong-related foreign affairs. The central government of China and the government of the Hong Kong Special Administrative Region handle the relevant issues in accordance with law. It falls within China's sovereignty to decide who is allowed to enter the Chinese territory and who is not. Hong Kong has returned to China in 1997 and Hong Kong affairs are purely China's internal affairs. The Chinese government's firm opposition to interference in China's internal affairs by any foreign government, organization and individual in any form remains steadfast. As to whether the person you mentioned arrived in Hong Kong with the intention to interfere in the internal affairs and judicial independence of the Hong Kong Special Administrative Region, he knows that well enough himself. In response to the relevant remarks of the British government, the Chinese side has lodged solemn representations with the UK.